To get the most power out of a stock or modified vehicle, it is necessary for the exhaust to flow cleanly and unrestricted. However, a stock exhaust and muffler system can significantly reduce the flow of your exhaust system. Stock exhausts are perfect for daily driving, as they keep your exhaust quiet and local law enforcement out of your rearview mirror. But if you take it to the track, that stock exhaust can really put a damper on the time of your passes. 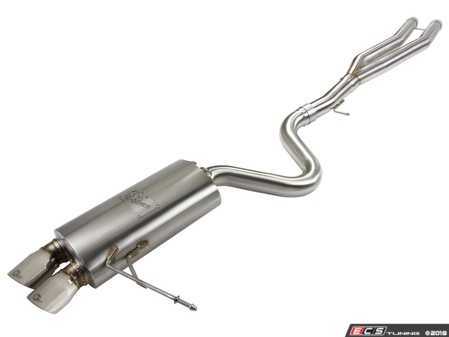 Upgrade your exhaust system while adhering to local laws with this system from AFE. The kit installs easily, using all of the stock mounting locations of your factory exhaust system but will give a more free flowing, higher performance sound. With exhaust gases leaving faster, more air can be drawn in, and better throttle response and horsepower can be expected. This unit features dual mandrel-bent tubing and utilizes polished 304 stainless steel. aFe found 4 hp and 8 ft/lbs of torque at the wheels on their test 328i.